The scale of the Panama Canal construction to excavate new channels, widen existing shipping corridors, and complete three new lock chambers on the Pacific side and three more close to the Caribbean make the canal expansion a 21st-century parallel to building the Egyptian pyramids. Click image to enlarge. PANAMA CITY, Panama — It was an elaborate, even theatrical display of national pride and elite engineering. On January 19, Panama’s four-quarter, red and blue starred flag gleamed in bright morning sunlight as a 2,300 metric ton steel gate slid into place inside a colossal new lock of the Panama Canal. It was the first of eight mammoth gates, ranging in height from seven to nine stories, to be installed in the three concrete locking chambers near the canal’s Pacific entrance. 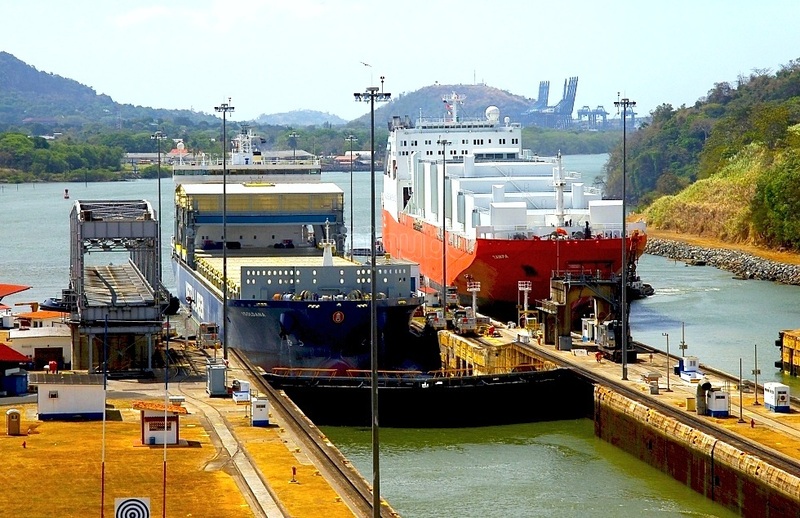 Almost 90 percent complete now and scheduled to open for commercial traffic in the spring of 2016, the roughly $US 6 billion canal expansion is expected to double the amount of cargo that crosses the Isthmus of Panama to 660 million metric tons per year. Thousands of men and hundreds of trucks and excavators, like a colony of motorized ants, swarmed through the construction site to bend steel and pour concrete. The scale of the project to excavate new channels, widen existing shipping corridors, and complete three new lock chambers on the Pacific side and three more close to the Caribbean make the canal expansion a 21st-century parallel to building the Egyptian pyramids. With its much larger locks lifting and lowering much bigger ships for the day-long crossing, the expanded canal is projected to alter global patterns of food and energy production and trade. Analysts anticipate that the additional transport capacity will shift water use and supply, particularly in the United States and China, the primary producers and consumers of goods that are shipped through the canal. The expansion project’s effects on Panama’s economy and management also are extraordinary. Both the Pacific and Caribbean entrances are swollen with new construction. Proposals for big power-generating, fuel-storage, logistics, and transport projects in the canal corridor are under review by national authorities. 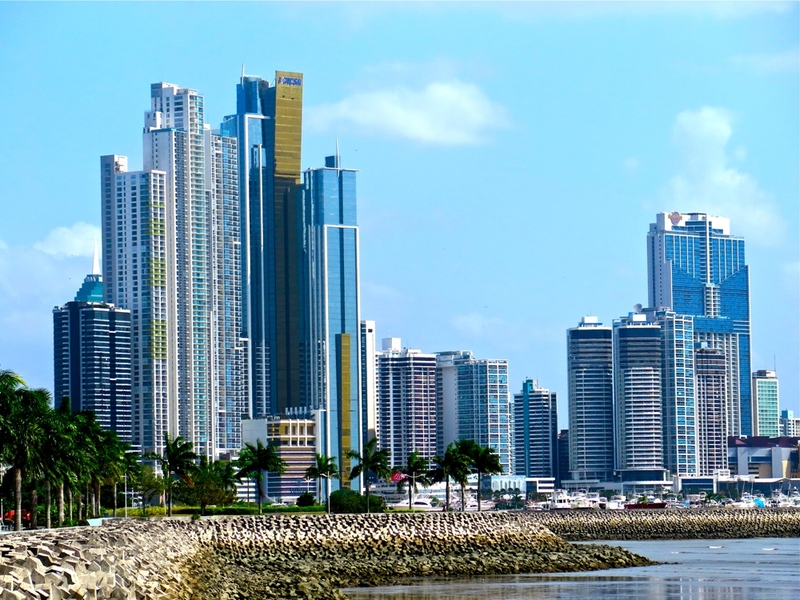 The canal’s ability to drive economic growth is evident in Panama City, the capital, where an impressive skyline of seaside white towers bloomed in the last decade. The Pacific coast city of 1.5 million people has quickly become a modern maritime hub where jobs are plentiful and employees are needed for almost 100 banks holding more than $US 100 billion in assets, as well as for hundreds of shipping firms and busy container terminals. The effects of the Panama Canal expansion project on Panama’s economy and management are extraordinary. Panama City displays an impressive skyline of seaside white towers that did not exist a decade ago. The Pacific coast city has quickly become a modern global maritime capital. Click image to enlarge. 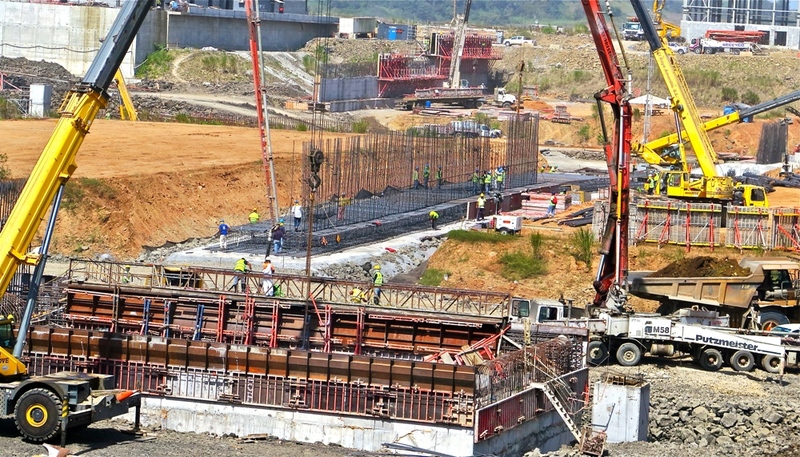 Along the Caribbean coast, the canal expansion also is attracting developers of mega-projects who are testing Panama’s regulatory agencies with proposals that could have substantial effects on the nation’s water resources and tropical landscape. The projects include a $US 6.4 billion open-pit copper mine powered by a 300-megawatt coal-fired power plant, a $US 8.7 billion container terminal east of Colon, and a $US 4 billion residential resort. Contractors here and in the United States say that the expansion project also can be seen as a global model of astute construction management. The opening of the expanded canal is expected to cost less than $US 6 billion, just 10 percent more than the original $US 5.25 billion price tag. Its commercial opening in 2016 will come a year later than anticipated. In contrast, the construction of the $US 3 billion Olmsted Locks and Dam on the Ohio River, the largest inland navigation project in the United States, is more than $US 2 billion over budget and decades late in opening. In every major study that assesses the new canal’s influence on trade, including a 2013 report by the U.S. Maritime Administration, researchers find that among the project’s big effects will be increasing the flow of American energy products to China and Japan. The reason relates to the canal’s size. The new locking chambers — of which there are six — are longer, deeper, and wider than their forebears, which translates into a three-fold increase in a chamber’s holding capacity. The supersized locks enable contemporary Capesize bulk ore vessels, big liquid natural gas (LNG) carriers, and much larger liquid petroleum and bulk chemical tankers to make the run from American ports to Asian ports. As a result, natural gas, propane, and petroleum liquids shipments from the United States to Asia are expected to grow substantially. Coal exports from the United States to China also could expand. The Panama Canal expansion is expected to sharply increase the amount of cargo that passes from the Caribbean Sea to the Pacific Ocean each year. Click image to enlarge. The Maritime Administration study noted that American grain production should increase because the expanded canal and larger ships will make it less expensive to export American harvests of soybeans, corn, and wheat to Asian markets — though how much less expensive is unclear. Shippers await the Canal Authority’s new toll structure for the expanded locks. In August 2012, Alberto Alemán Zubieta, the canal’s former administrator, illustrated the projected cost savings. A shipment of eastern U.S. coal from the Port of Baltimore to Xiangang, China, in a Panamax vessel that fits the existing canal costs about $US 35 per ton, said Zubieta. Shipping the same amount of coal between the same two cities in the larger post-Panamax vessels would cost approximately $US 25 per ton. Zubieta also estimated that grain transported to Asia from the U.S. Midwest and Great Plains would cost about $US 50 per ton in the larger bulk carriers, or $US 5 less per ton than in the Panamax vessel. The effects of these trends on global water supplies could be substantial. International trade in farm and industrial products accounts for 2.32 trillion cubic meters (612 quadrillion gallons) of water use annually, according to a study in 2011 by UNESCO-IHE Institute for Water Education, a water research institute in Delft, the Netherlands. Trade in crops contributes 76 percent to the total volume. Trade in animal and industrial products contributes 12 percent each, according to the UNESCO-IHE study. Panama’s government decided to expand its 77-kilometer (48-mile) canal knowing the many risks, among them the threat of competition from nearby Nicaragua, whose leaders plan to build a massive new shipping channel from the Pacific to the Caribbean. It is not clear how much of a competitor the proposed Nicaragua canal represents to the Panama Canal. The proposal, by a Chinese developer, calls for a 22-meter (72-foot) deep waterway, built at sea level, that will cost $US 50 billion, according to preliminary estimates. Engineers who are familiar with such mega-projects put the price tag at $US 80 billion or more for the 286-kilometer (178-mile) canal. Financing will have to be supplied from outside Nicaragua, which has a $US 30 billion gross domestic product. Such high construction costs will make it difficult, if not impossible, for the Nicaragua canal’s owners to charge tolls that are competitive with the Panama Canal’s tolls. The official start of the Nicaragua project came in a ceremony in late December 2014 that was attended by Wang Jing, a Chinese telecoms entrepreneur and head of the Hong Kong Nicaragua Canal Development Co. Jing told reporters that the proposed canal could be finished in five years. News reports at the time estimated that Jing amassed $US 200 million in funding to build the project. Panama Canal executives say they are not terribly concerned about the Nicaragua project, which is more than three times longer than their canal. They note that feasibility studies central to understanding the Nicaragua project’s potential economic and engineering success were postponed to April 2015. An environmental impact study, required by Nicaraguan law, has not been conducted. Excavation work is not scheduled to begin until after June 2015. Civic opposition also is mounting in Nicaragua because of the toll that the project would have on Lake Managua and the rainforest. Lastly, marine environmental organizations warn that a sea-level canal would enable poisonous Pacific sea snakes to migrate into the Caribbean, threatening the region’s beach-based recreation and tourism industry. The Panama Canal currently accounts for 3 percent of global trade volume, a share that is expected to increase to 6 percent to 7 percent over the next decade. In terms of water use, 7 percent of global trade equals roughly 174 billion cubic meters (46 trillion gallons) of water annually. That is equivalent to one-third of all the water that was used in the United States in 2010, according to the most recent water-use assessment by the U.S. Geological Survey. 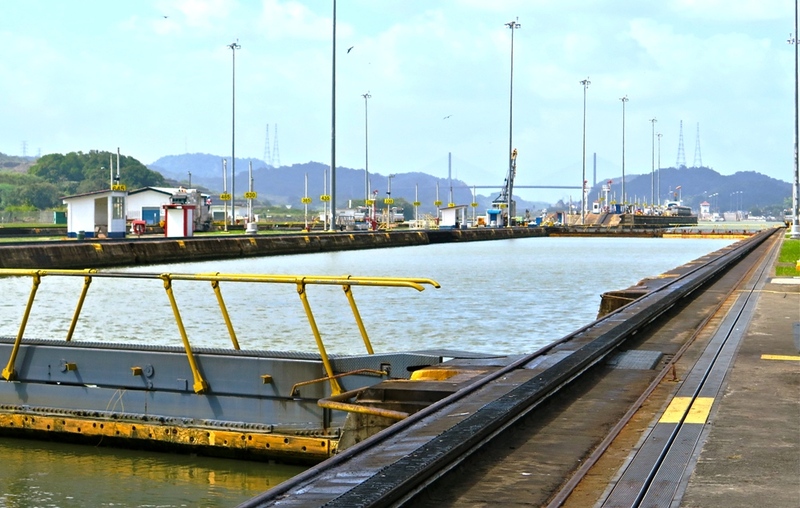 Two cases in point involve energy and agricultural products transported through the expanded Panama Canal. In the United States, coal production to serve the increased exports to China would exacerbate water pollution from acid mine and toxic metal pollution in the eastern coal belts of Illinois, Indiana, Kentucky, Ohio, and Tennessee. It also would put more pressure on already scarce freshwater reserves in Asia to cool coal-fired power plants in China. The heightened trade in petroleum products and natural gas from the United States is likely to affect water supplies needed for fracking in the oil and gas fields of Ohio, Pennsylvania, Texas, and the Great Plains. Under current weak and largely voluntary water-treatment measures, an increase in hydraulic fracturing could increase water pollution from fracked wells. In China, though, increased use of U.S. natural gas to fuel power plants would reduce water use. Generating a kilowatt of electricity from natural gas uses 60 percent less water than generating an equal amount of power from coal, according to the U.S. Department of Energy. Similarly, increased grain trade between Asia and the United States has consequences for water use in both places. The Midwest grain belts — which stretch from Ohio to Missouri and Iowa — are water rich. But the eight-state Great Plains, which supports a $US 30 billion agriculture and livestock industry, could experience canal-related water-supply pressures. The Great Plains, which relies on the Ogallala Aquifer to produce one-fifth of the 410 million metric ton annual U.S. corn and wheat harvest, faces a new era of reckoning. The Ogallala’s users pump significantly more water out of the aquifer than filters back into the ground. Increased grain production to serve Asian markets will put more pressure on the Ogallala. As it is, shipments of U.S. grain and energy resources through the canal are increasing. In 2014, 48.6 million metric tons of grain — most of it produced in the United States — moved through the canal from the Caribbean to the Pacific side for shipment to Asia, an increase of more than 50 percent compared to 2013. Shipments of petroleum liquids from the Caribbean side to the Pacific, most of them refined and processed along the U.S. Gulf Coast, reached 32.3 million metric tons in 2014. Coal and coke shipments, principally from Colombia and eastern U.S. coal fields, totaled almost 14.3 million metric tons. In all, bulk container shipments to Asia totaled 89 million metric tons, or 27 percent of the tonnage handled by the canal. When the much smaller reverse Pacific-to-Caribbean trade is included, bulk chemical and energy shipments accounted for $US 687 million in tolls, or 36 percent of the $US 1.9 billion that was paid to the Panama Canal Authority by merchant ships last year, according to authority figures. From her office in the U.S.-built Panama Canal Authority headquarters, decorated with a coat rack that holds her pink construction helmet and pink safety vest, Ilya R. Espino De Marotta patiently supervises the mammoth project that is shaping her country. 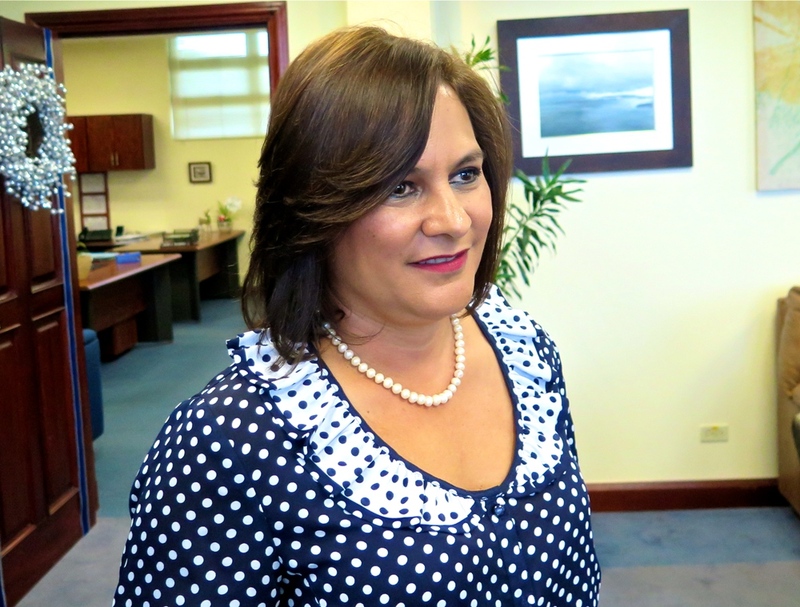 Appointed two years ago to supervise the mammoth expansion project, Panama Canal Authority’s executive vice president, Ilya R. Espino De Marotta, is one of the highest ranking women in Panama. Marotta is so well-respected that she is a candidate for the Canal Authority’s top job as administrator and is being recruited for the nation’s top job as president. Click image to enlarge. Appointed two years ago to succeed Jorge L. Quijano, who became the authority’s administrator and chief executive, Marotta is one of the highest ranking women in the country and is so well-respected that she’s a candidate for the Canal Authority’s top job as administrator or the nation’s top job as president. The next presidential election is scheduled for 2019. Marotta’s reputation rests on her characteristically unflappable and engaging demeanor. Those personality traits served her and the Canal Authority well during several strikes by construction workers, as well as very difficult disagreements over contract provisions and payments to the international consortium of companies that are building the new canal. It should hold Marotta’s attention. 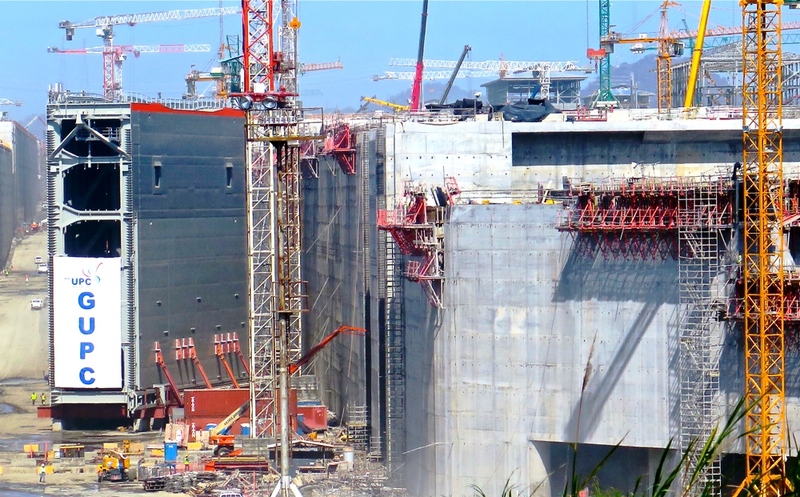 Constructing the third set of locks is one of the largest and most complex construction projects on the planet right now. Like almost every other facet of the Panama Canal, the expansion is a study in history, fluid dynamics, and keen water management. The United States took over the original canal-construction project from the French in 1904 and completed it in 1914. The result is a 77-kilometer (48-mile) water route across the isthmus with groupings of side-by-side locks; one group on the Caribbean side and two more groups on the Pacific side. The United States took over the original canal-construction project from the French in 1904 and completed it in 1914. The result is a 77-kilometer (48-mile) water route across the isthmus with groupings of side-by-side locks; one group on the Caribbean side and two more groups on the Pacific side. Click image to enlarge. In the late 1930s, the U.S. military began construction of a third set of locks but halted the effort in 1939 at the start of World War II. President Jimmy Carter (D: 1977-1981) launched the process to turn over the canal to Panamanian ownership and management in the late 1970s. Panama gradually assumed ever-more management authority and expertise, and the country gained full control on December 31, 1999. The contemporary expansion builds on the previous work but with 21st-century principles of water use and water management, which are defined by the need to conserve water and safeguard the canal’s expansive 345,000-hectare (1,332-square-mile) watershed. Water is used to fill the old locks with water to raise ships 26 meters (85 feet) and then lower ships by the same amount. It takes 208,000 cubic meters (55 million gallons) of water per transit or lockage, according to the Canal Authority. 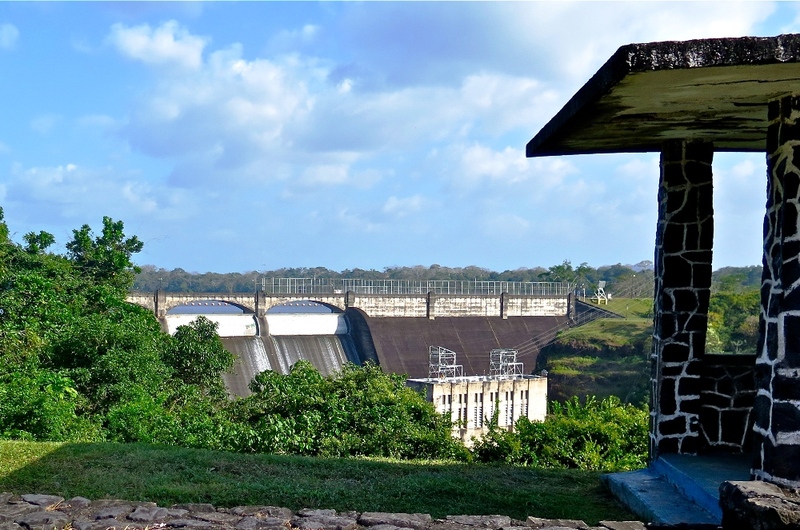 Madden Dam was completed in 1935 for water storage for the canal and Panama City and to supply 33 megawatts of electrical-generating capacity to the Panama Canal Authority and to Panama. Click image to enlarge. 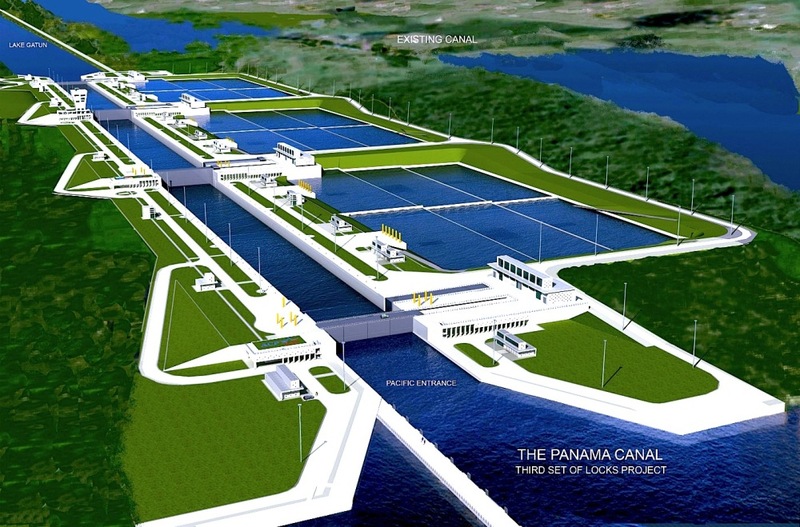 Before 2006 — when 80 percent of Panamanian voters cast ballots in favor of the canal expansion — the authority’s engineers considered building a third reservoir to supply water for the third set of locks. The reason: filling the new locking basins would take 483,600 cubic meters (128 million gallons) cubic meters of water per lockage. That would have meant high expense, enormous changes in land use, and evicting some of the 150,000 people who live in the watershed. A better way involved an idea proven in Germany. Canal officials installed storage basins alongside the new locks to recycle 60 percent of the water that is used in lockages before it is discharged. The recycling technology enables the new locks to use 7 percent less water than the existing locks, or 193,500 cubic meters (51 million gallons) per lockage. The water savings nullified the need for a new reservoir, said Carlos A. Vargas, the Canal Authority’s executive vice president for water and energy. “It’s smarter. It’s cheaper. It uses less water,” Vargas said. Still, the new locks will also use more than 7 million cubic meters (1.8 billion gallons) of water for the 13 to 15 big ships that will cross the isthmus each day. With a roughly 15 million cubic meter (4 billion gallon) daily demand for water, the authority still needed a larger water supply. That problem was solved in large part by raising Gatun Dam and raising Lago Gatun’s maximum operating level by 45 centimeters (18 inches). The authority also is dredging deeper navigation channels and controlling sedimentation by replanting tracts of forest, controlling tree cutting, and improving farm-cultivation practices. Standing on the bottom of the canal’s nearly completed locks is an exercise in feeling small. Three lock chambers unfold in a concrete canyon nearly two kilometers (1.2 miles) long. Graders and haul trucks at one end are so distant they appear as small as pencil points. Hanging from the sides of the chamber, here and there, are men on platforms drilling bolts in the concrete. The sound of groaning diesels and whining drills fills the space. 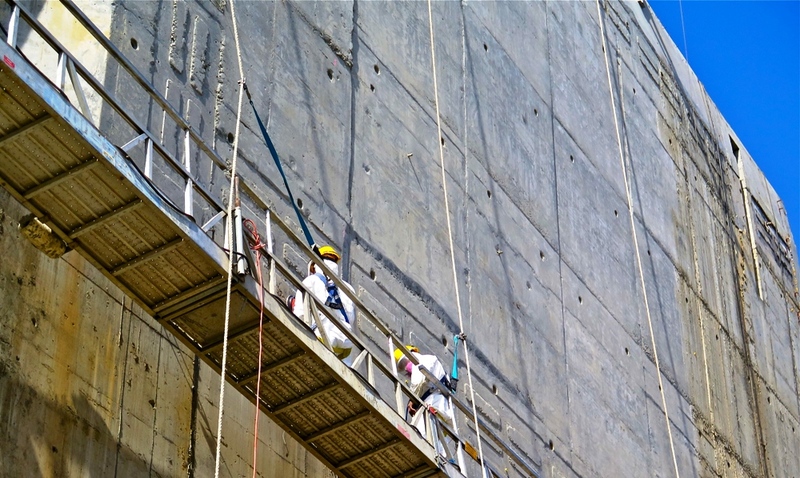 Hanging from the sides of the new Pharaoh-like locking chambers are men on platforms drilling bolts in the concrete. The sound of groaning diesel equipment and whining drills fills the space. Click image to enlarge. Well over 100 million cubic meters (3.5 billion cubic feet) of earth were excavated for the project. Tens of millions of cubic meters of concrete were poured, enough to construct a sizable city. The Panama Canal currently accounts for 3 percent of the volume of global trade, a share that is expected to increase to 6 or 7 percent over the next decade. Click image to enlarge. A German technology to conserve water involves installing storage basins alongside the new locks to recycle 60 percent of the water that is used in lockages before it is discharged. The recycling technology enables the new locks to use 7 percent less water than the existing locks, nullifying the need for a new dam and reservoir. Click image to enlarge. The Mira Flores locks, opened in 1914, are the start of a maritime shortcut from the Pacific to the Caribbean that takes ships eight to 10 hours to complete. Click image to enlarge. Comparison between the Panamax ships that fit the old canal locks and the post-Panamax ships that fit the expanded locks. Click image to enlarge. 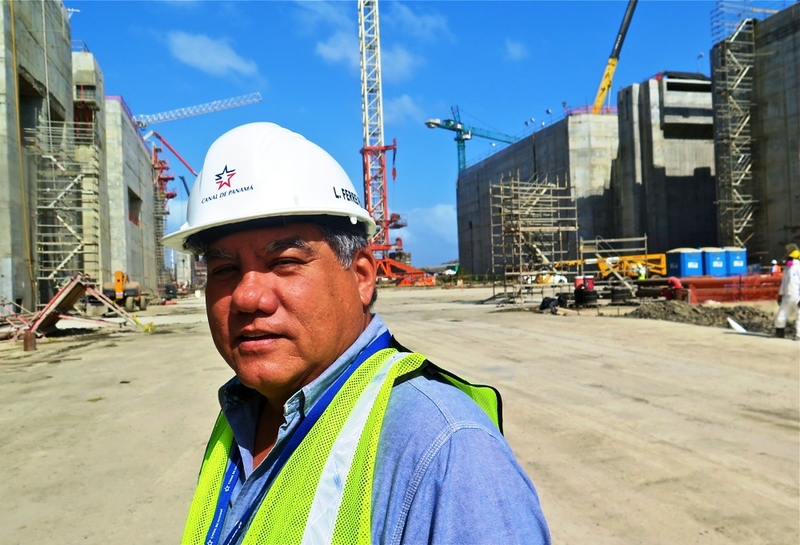 Luis Ferreira, an architect and engineer, has worked for the Panama Canal Authority for 40 years. “It’s big,” he says of the expansion project. “But it may not be big enough. There are ships out there already that are too big for the new locks.” Click image to enlarge. Thousands of men and hundreds of trucks and excavators, like a colony of motorized ants, swarm through the Panama Canal construction site to bend steel and pour concrete. Here, workers complete basins for recycling water during lockages. Click image to enlarge. Sadly, the sort of reporting that gets done by foreign reporters who come down here and submit to Panama Canal Authority minders. Respectfully, your effort at a comprehensive report is to be commended. But your gullibility and lack of reporting, leaves this a simple propaganda piece. There are worrisome corruption issues with the canal expansion (surprised no mention of the low ball bid, the construction company of the Canal administrator, the several technical faults in the original designs…the bankruptcy of Sacyr and much more). ” …the highest ranking woman in the government?” left us scratching our heads. No mention of the northern sea lanes that are now open, that are not (and were not in original studies) taken into account when projecting shipping trade volumes…. or the issues with alajuela now being full of silt and lost storage capacity, or the high winds that already make navigation through culebra an epic challenge – and many senior pilots have pointed out, they were never consulted if it was possible to navigate post panamax through culebra due to wind (they say it’s not). The issues go on and on. Despite the claim that the canal authority is “Autonomous” from all the current political scandals in panama, it is not true. Martinelli will end up in jail. The contracts awarded for the canal expansion are known to include major kickbacks that are being uncovered. And the cement and construction is linked to every other real estate money laundering deal rampant across the city. It is one of the most shameful periods in our history. The canal expansion it can be said, nearly brought our nation down. 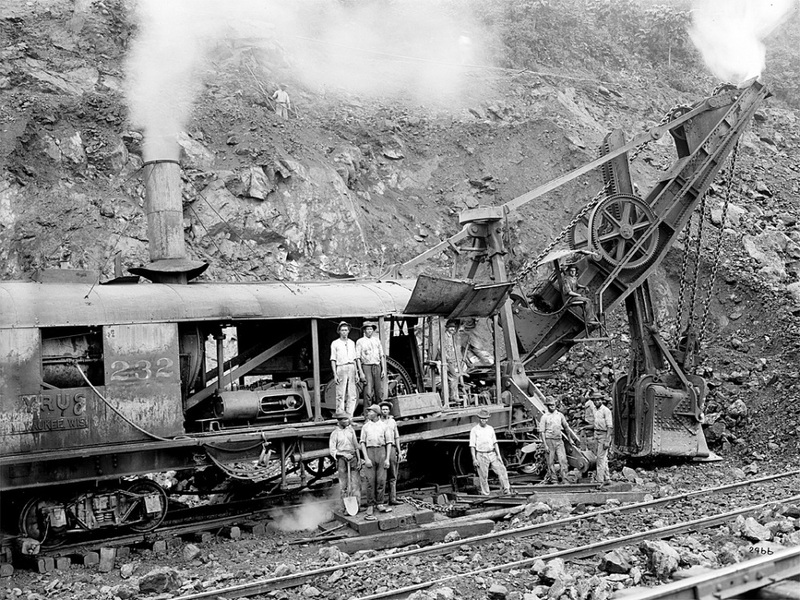 As part of the canal treaties, all the canal revenue was to be used for social and public infrastructure works in Panama. Unfortunately, they found a way to get their hands all over the cash, with politicians awarding themselves contracts. We wish the canal expansion was as simple as your present it. It’s not. The social and political issues threaten the most core cultural fabric of the nation. The Stream, January 27: Tropical Andes Glaciers Declining At Fastest Rate in... Infographic: The Drier, Wetter, Warming U.S.